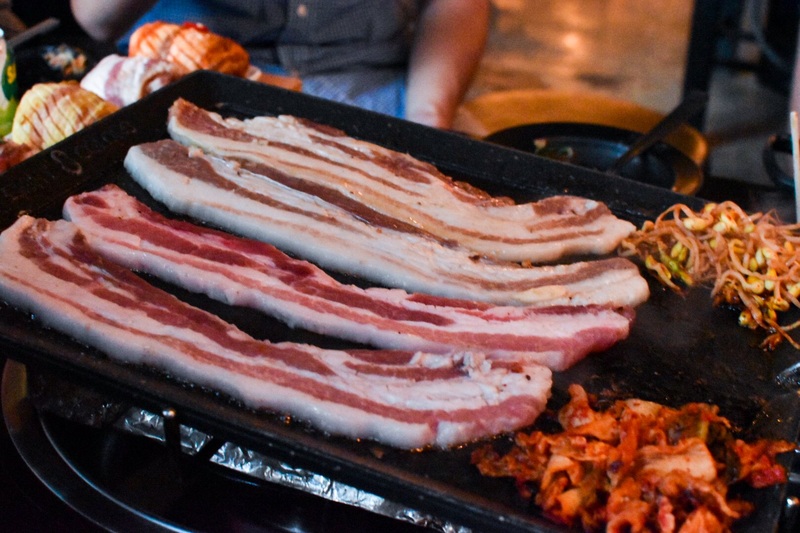 I mean, seriously, who can resist Korean BBQ? Even though it makes us smelly most of the time, we still keep going back for more because there’s something about having meats cooked in front of us, having a meal with a group of friends, overeating together, and just tasting those juicy tender proteins that contribute to that hedonistic experience. I know. I can’t stop myself too. 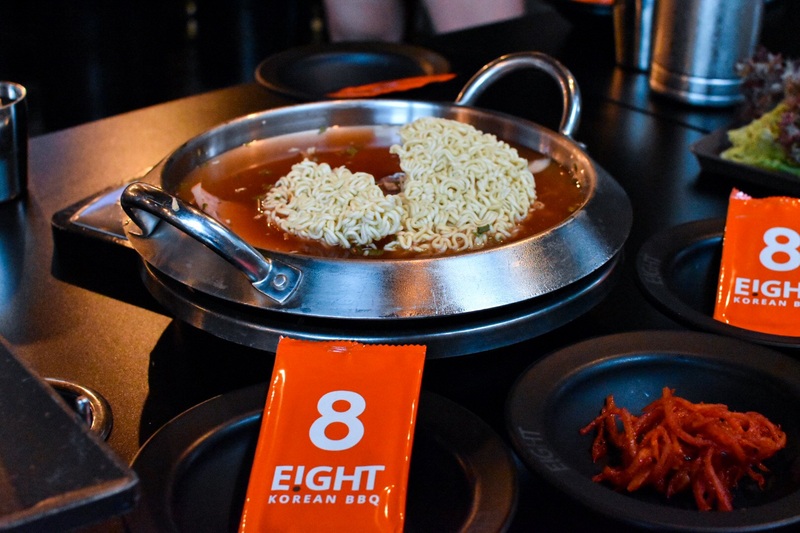 8 KOREAN BBQ is one of those places that I’ve been longing to visit for my Korean BBQ fix after I’ve found out that this place serves up MANGALITZA PORK for their meats. 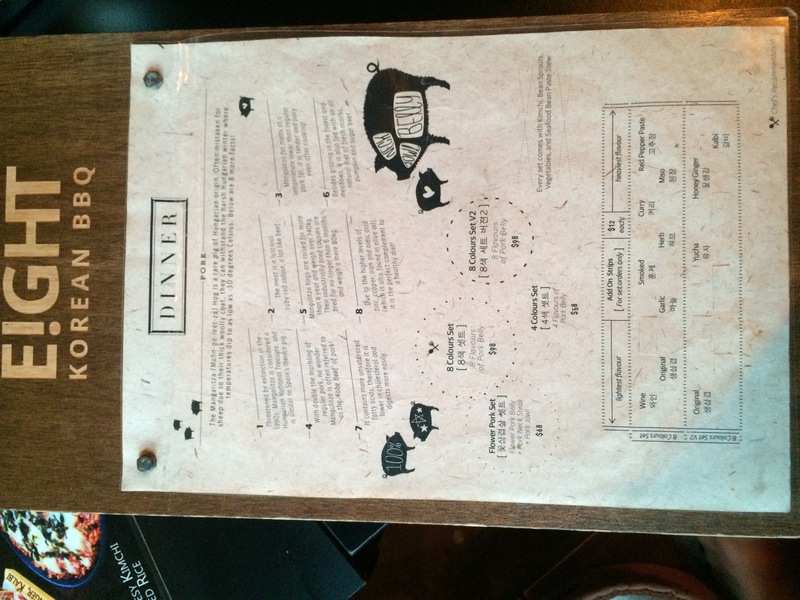 Hmm.. Mangalitza pork. Sounds familiar? 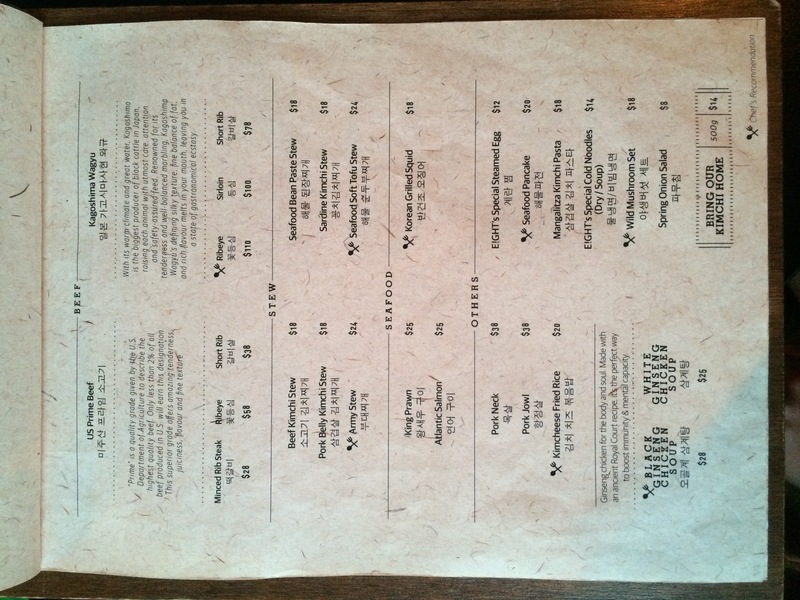 Yes, they are by the same people behind Joo Bar, and this means their meats are definitely TO DIE FOR. 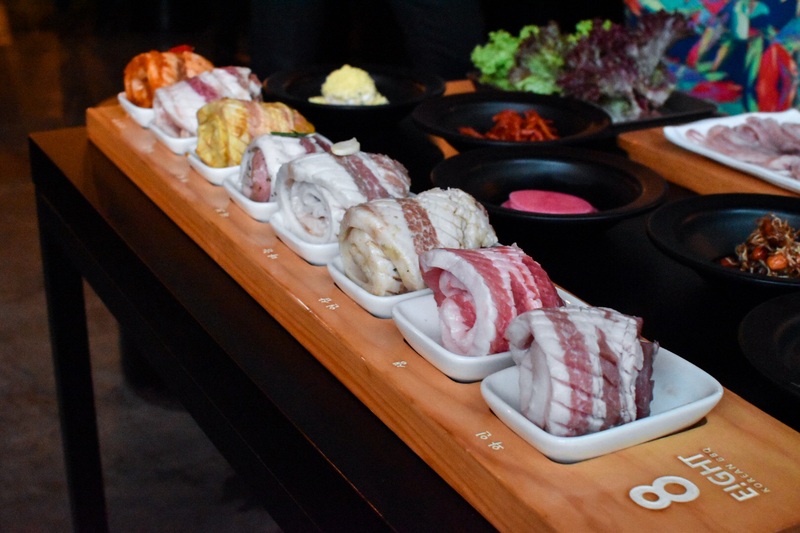 Even if you don’t take pork, they also have premium cuts of beef such as that of USDA Prime and Kagoshima Wagyu. Pretty dang enticing! 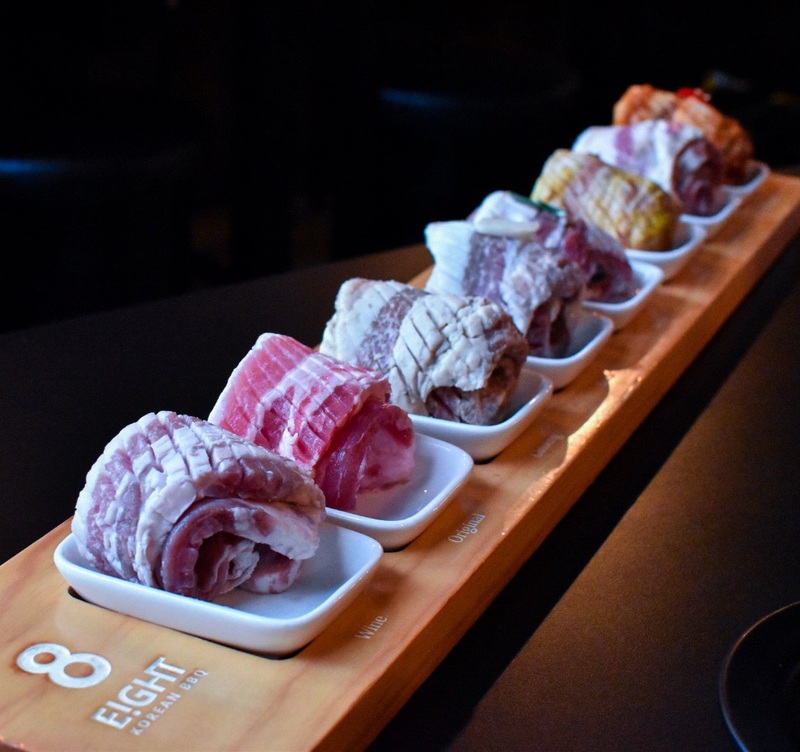 Because they serve up the EIGHT COLORS SET of Mangalitza Pork Belly in different flavors. Like this.. If this doesn’t make you close your browser immediately and make plans to head on to 8!, YOU GOT SOMETHING WRONG AH. HAHA! The Central at Clarke Quay is not quite the most happening place to go, even though they are situated at one of the most happening areas in Singapore. Some of my friends haven’t even heard of this mall, BUT knowing that 8! is situated here, this might be game changing. The Central, is in fact really easy to get to as it is located just above Clarke Quay MRT station! 8! sits in the “Blue Zone” of The Central, just a storey above Subway from the exit leading towards Swissotel! I didn’t manage to capture any pictures of the interior because it is DARK. Like really dark. Black walls and all, so I thought there was not much point in taking any pictures, and WHO CARES ABOUT THE INTERIOR AS LONG AS I GOT GOOD FOOD? Like I mentioned earlier, even if you don’t take pork, they have other quality cuts of meat like Beef, Chicken and even seafood! 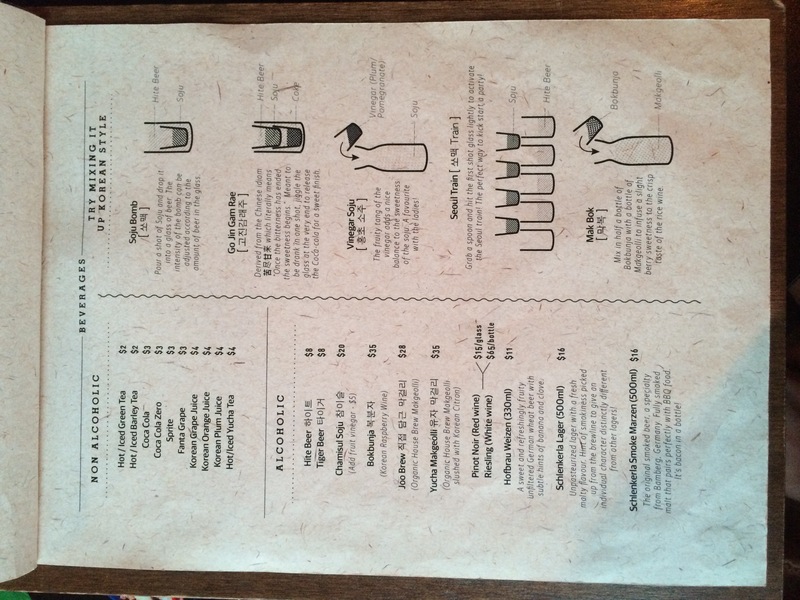 And like JOO BAR, they also have Magkeoli too! YUZU MAGKEOLI IS MY FAVORITE. Oh gosh, I’m so excited just coming to this part of the post! Read on to find out more! 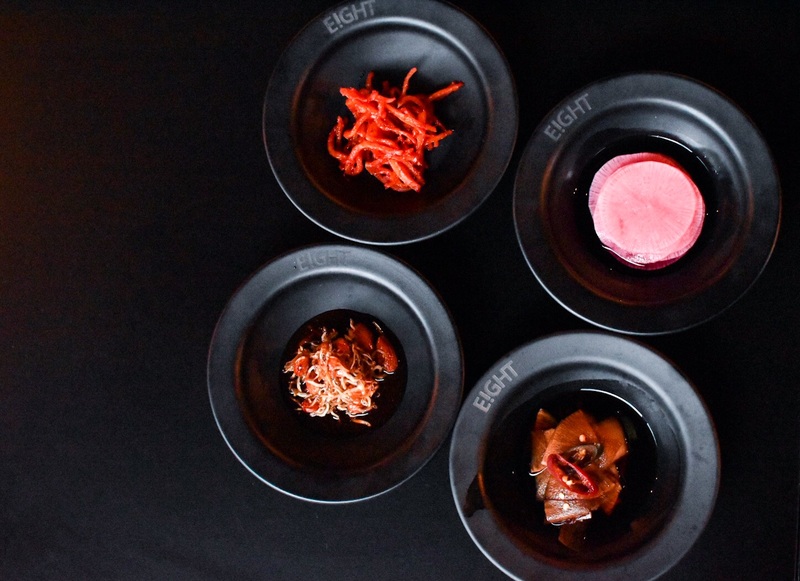 Banchan is served like your typical Korean restaurant! I’ll first introduce their Signature 8 Colors Set ($98++), good for 3 to 4, or even 5 pax! Sorry forgot to take picture of kimchi and beansprouts, but nehhh, you can see them at the corner of this picture! HAHA! GRILLED PIPING HOT KIMCHI IS DA BOMB, BY THE WAY. 3. Seafood Bean Paste Stew – But we had the Army Stew (+ $6) instead. You can choose to change to any type of stew you want actually, but a top up of $6 is required for Seafood Soft Tofu Stew and this Army Stew! The stew is possibly good for 4 pax and up, cause 6 of us shared it and it was just nice! 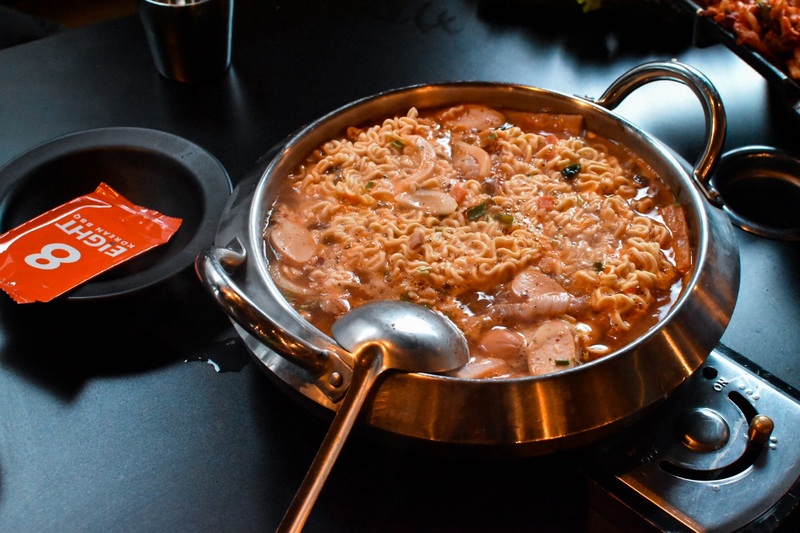 Honestly, it is just normal army stew lah, like kimchi maggi noodles! HAHA! But I loved the broth especially so I couldn’t stop going ladle after ladle, in the end, everyone else had dry noodles instead! 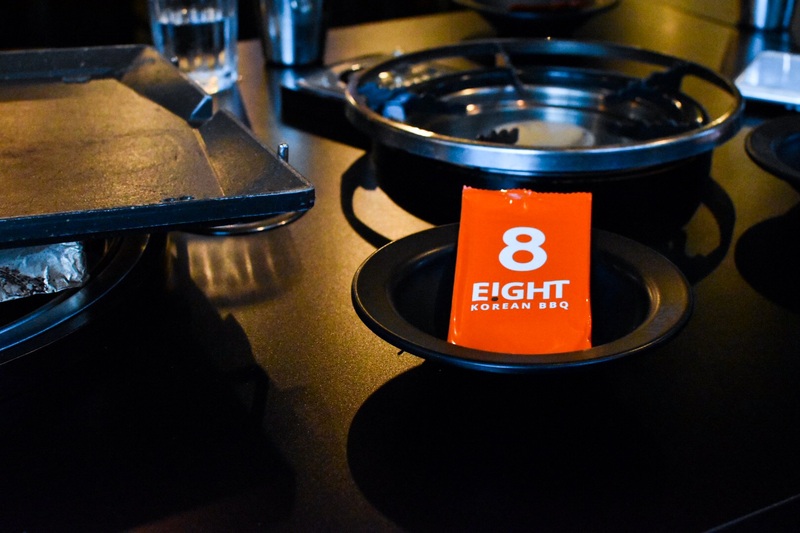 One thing GREAT about 8!, for me at least, is that their well-trained staff would BBQ your meats for YOU! My gosh, it’s a dream come true for me because I like Korean BBQ but I don’t like to cook my own meats cause I scared oil splatter on me. HAHA! And while cooking the meats, they’d lay a piece of oil absorbent sheet above the meats so that the oil wouldn’t splatter and you don’t leave the place smelling like bbq! 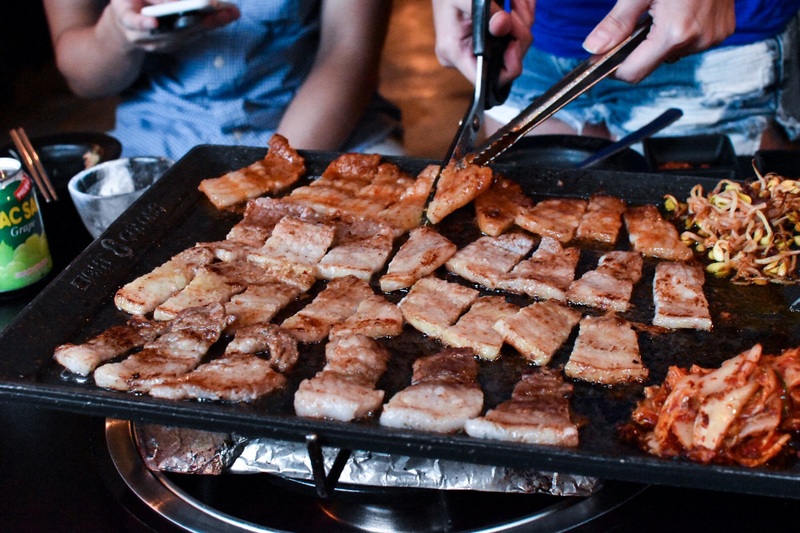 This is how the pork belly looks like when it’s unrolled. GAAAAAAH SO THICK AND JUICY. They are then cut for easy eating! 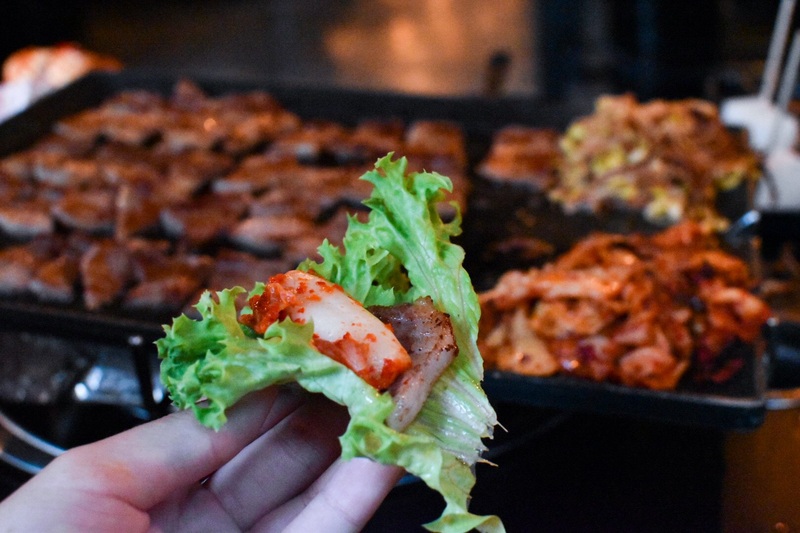 Wrap it with some greens, a slice of pork belly, and some kimchi, bon appétit! DAMN GOOD. That melt in your mouth pork belly.. 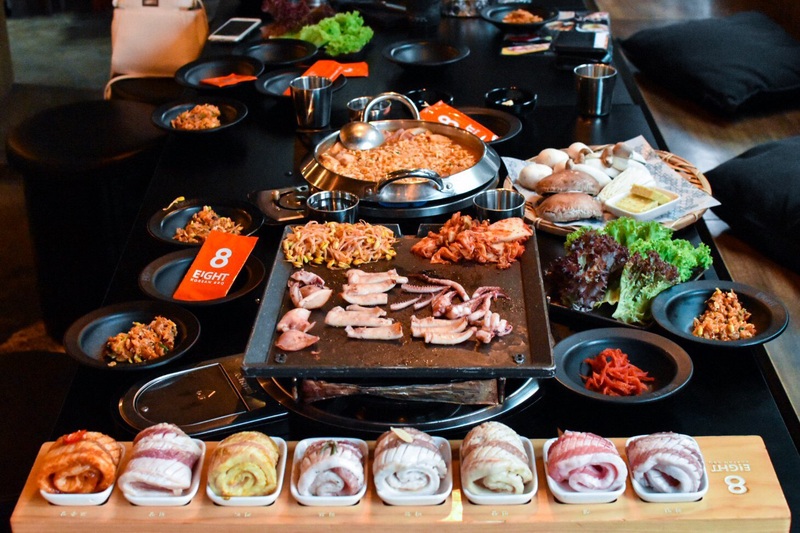 SO MUCH OOMPH in it, and we loved how this korean bbq experience is different from any other because of the interesting and different flavors they have! 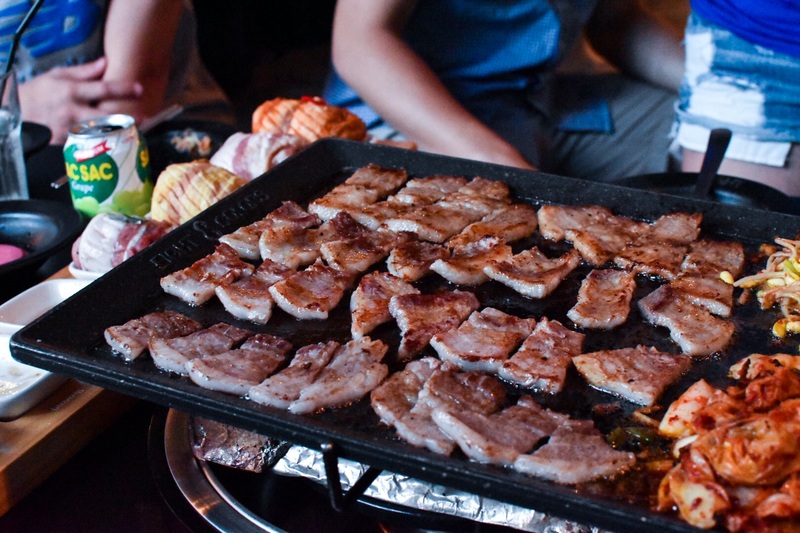 We especially loved the super well seasoned gochujang mangalitza! 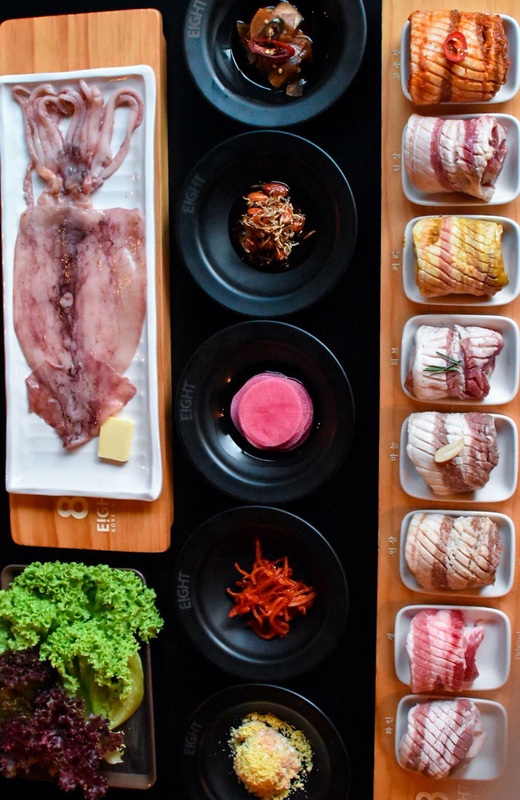 Besides their to die for Mangalitza, seafood lovers would be thrilled to find out that they also do offer Korean Grilled Squid ($18)! Look at THAT FAT SQUID. 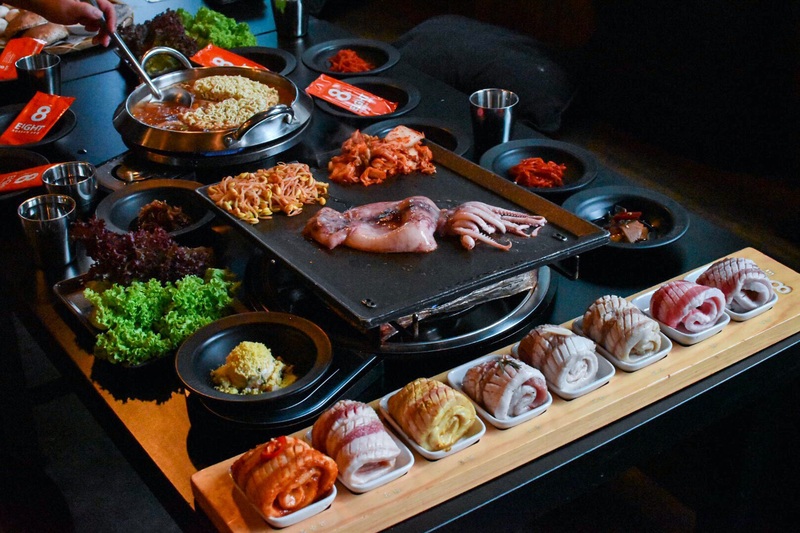 I don’t know if it’s just me, but I haven’t actually had any grilled squid in my Korean BBQ experiences and I LOVE GRILLED SQUID. Having this at 8! just made this experience the best one yet! Another option you could consider to enhance your experience – Wild Mushroom Set ($18) VERY SHIOK, the portobello mushrooms were DA BOMB. However, I got to admit it’s a little expensive though. Then again, mushrooms are expensive lil fungis, so.. Yeah. If you love mushrooms, YOU GOT TO HAVE THIS NO MATTER HOW EXPENSIVE IT IS. They have other mains that are good to share as well! Doesn’t look too appetizing to me initially, despite the runny egg in the middle! You’ve got to mix everything up for the optimal experience… Followed by a shot of this cheese pull – one for Instagram. And hey, despite its mehhh appearance, this was amazingly satisfying and really flavorful! 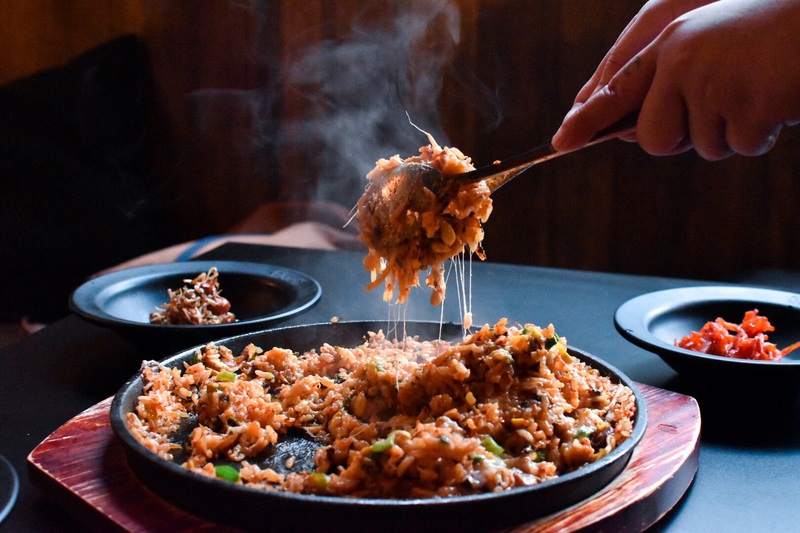 KIMCHI AND CHEESE is seriously the best combination ever! I could just come here for this! 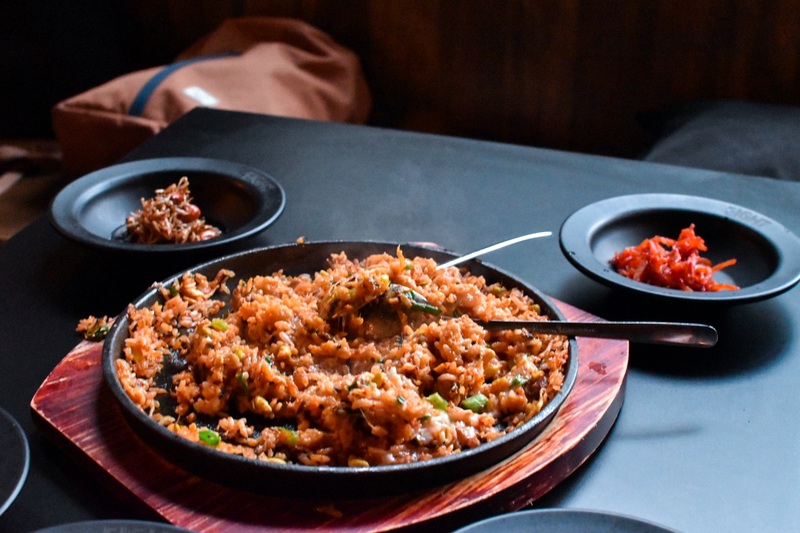 Alternatively, you could order a 4 colors set ($58) and order this kimcheese fried rice so that you can attempt to not over eat. Attempt. 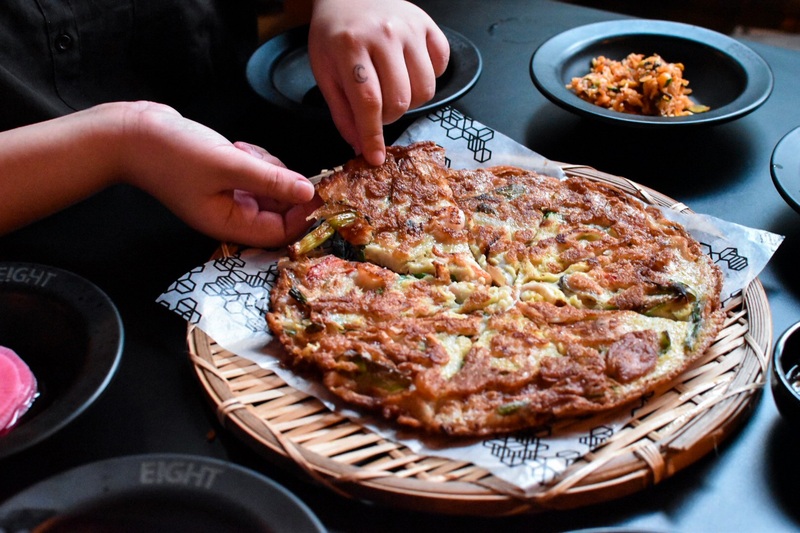 If you like Korean Pancakes, I guess you’d like this? Eggy textures with leek and seafood within! 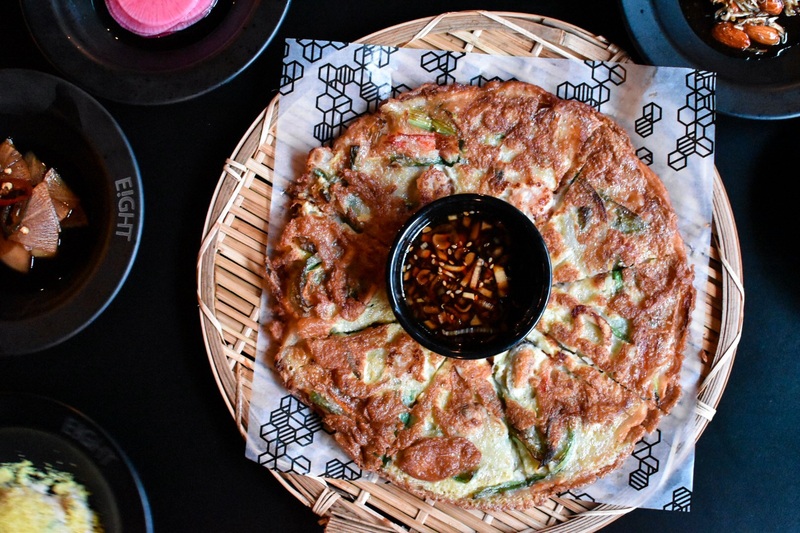 I’m not quite a fan of korean pancakes because I’ve always thought that their flavors are too mild for my liking! Dip it in the sauce provided to enjoy the umami-ness of the whole dish! Well.. With the mains all in our bellies, it is of course, time for DESSERTS! I’m surprised that 8! hasn’t done much publicity for their bingsus, because they are an absolute delight! 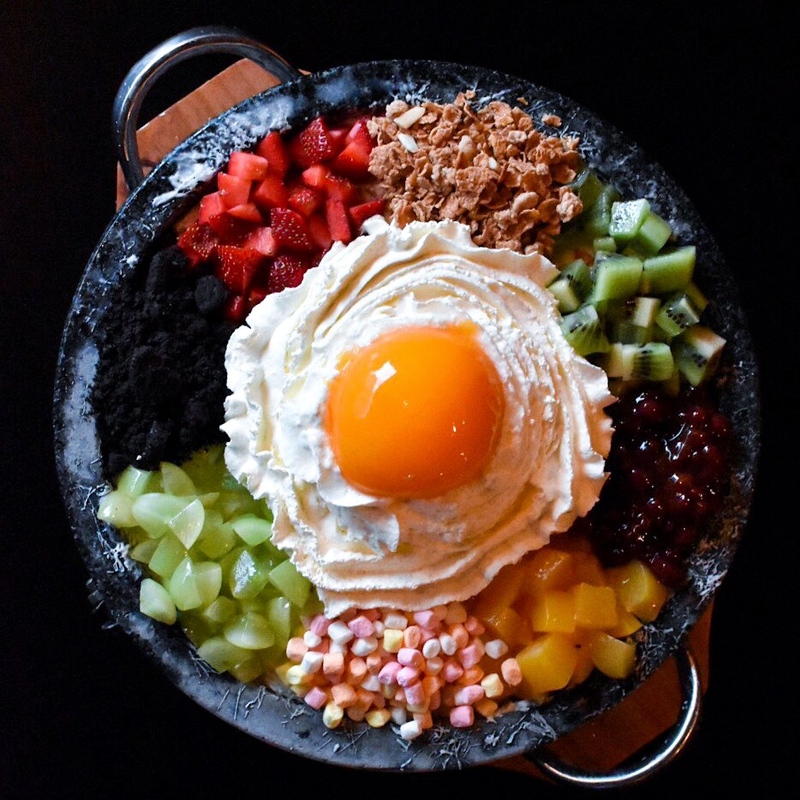 Bibimbap Bingsu ($28++) – yes you heard me right! Aiyo THIS IS TOO CUTE! 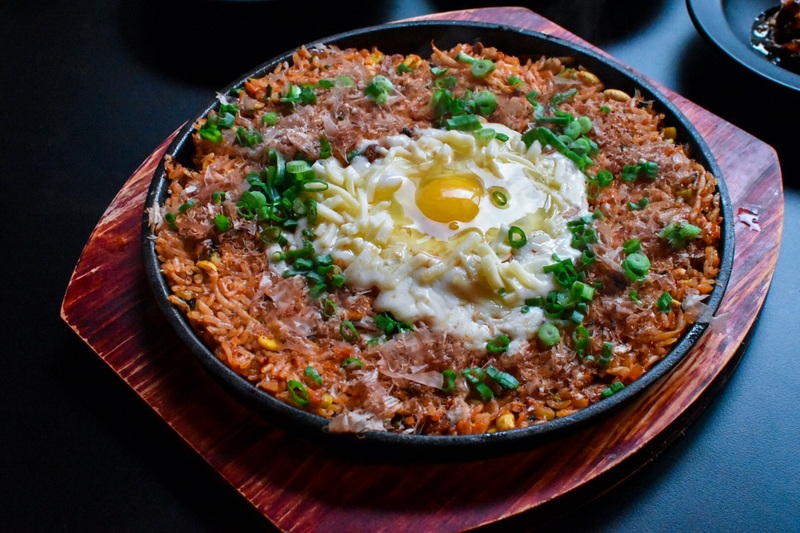 This looks exactly like a Bibimbap! How creative can these people at 8! be?! 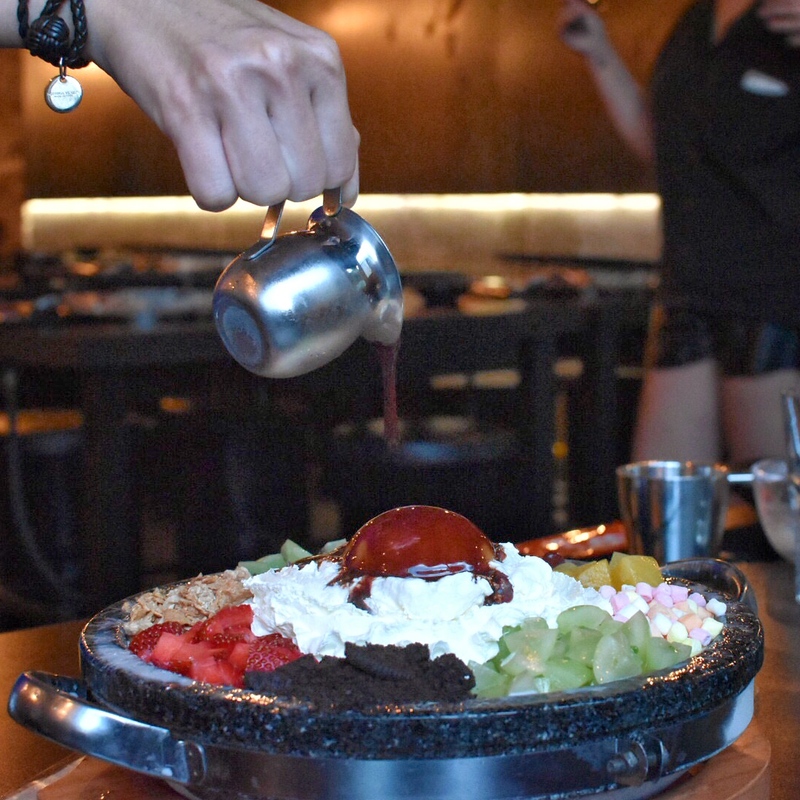 You can expect snowy textures of the bingsu within these generous toppings of sweets and fruits, just in case you were wondering what’s in the middle, it’s whipped cream and a peach! SO CREATIVE I CANNOT! It also comes with 2 choices of sauce – chocolate or strawberry, we went for the chocolate one, and NO REGRETS! This was really satisfying and a really fun dish, of course with those 10 different toppings, it’s great for sharing! We shared it amongst 7 of us, and it was more than enough! Yup, it is what it is. 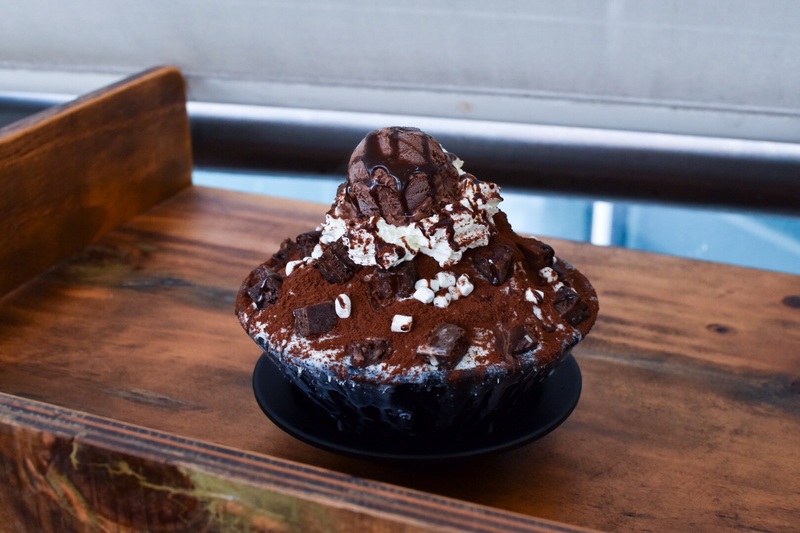 A super chocolatey bingsu. I wasn’t too excited when i saw this initially, because it’s chocolate lah, that’s all to it what. 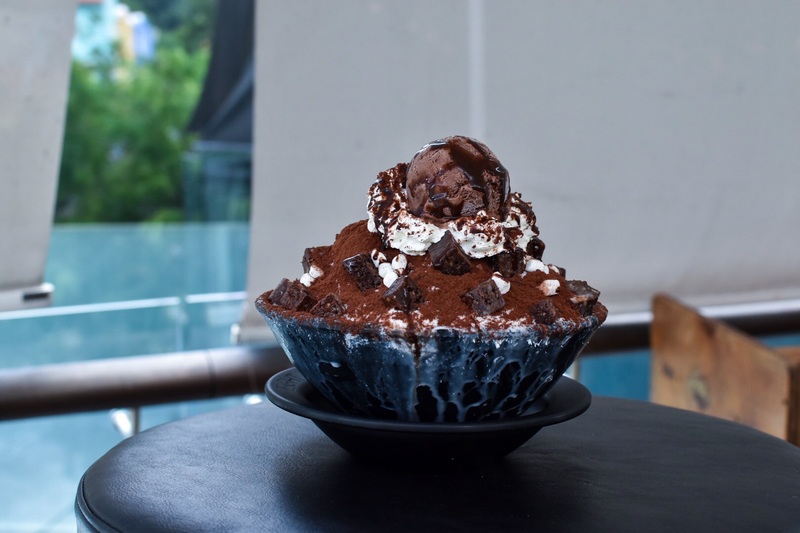 Chocolate ice cream, chocolate dust, brownies, marshmallows.. It’s THE dessert for all chocolate lovers. 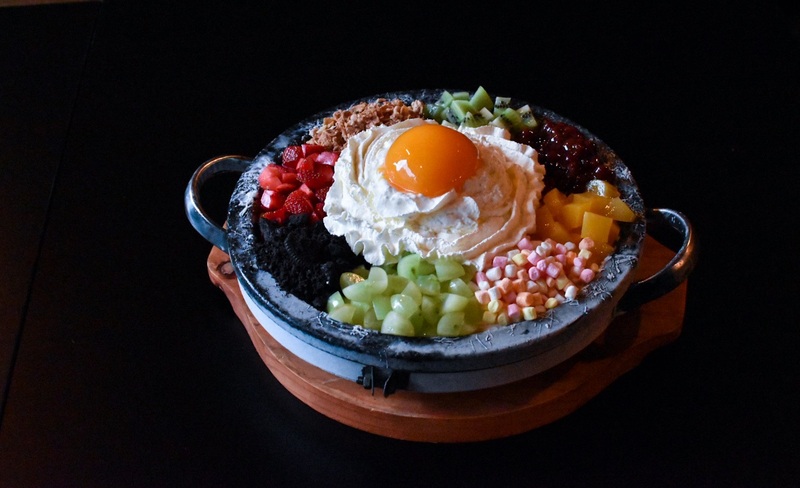 And guess what made this THE BEST AND MOST EXCITING bingsu I’ve ever had? When we brought it back into 8! (ya we took it out to take picture because it’s very dark inside), we found out that within this bingsu, there was A SURPRISE. Generous amounts of FROZEN STRIPS OF NUTELLA found beneath the snowy ice. This immediately became the center of attention on our table, and everyone was just trying to get the DAMN DELICIOUS nutella strips with every mouthful. This was just great. Awesome, in fact. Awesome is an understatement. I LOVED THIS, just because.. Frozen nutella strips. 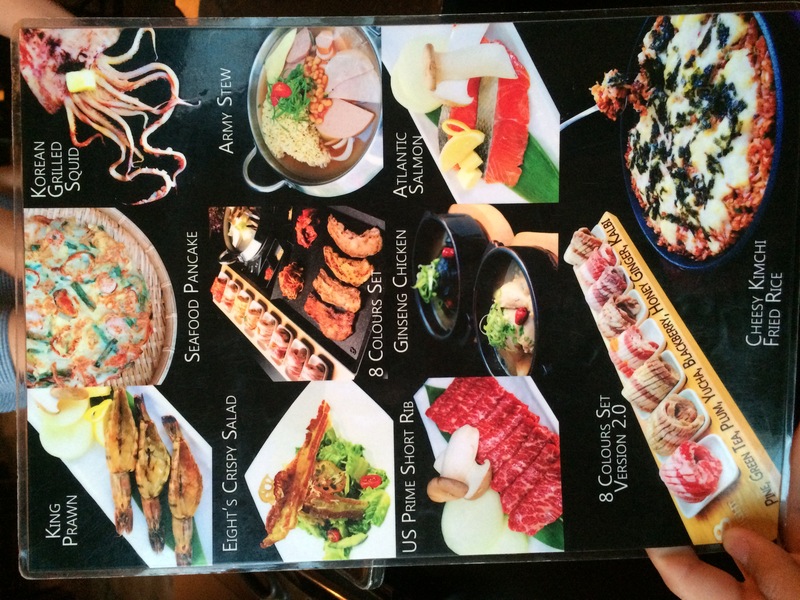 We’ve tried so much food at 8!, I think I gained 8kg while I was there! I was genuinely surprised to find that the other offerings at 8! were as good as their Mangalitza Pork Belly! 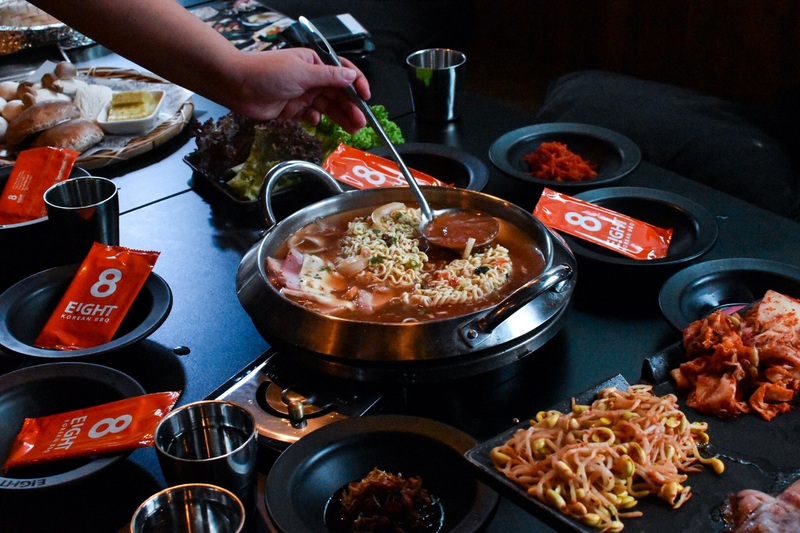 While their 8 color set revolutionized my Korean BBQ experience, their bingsus unexpectedly did the same for me too! The best part? Even though 8! reeked of the smell of BBQ, and I thought that I’d definitely smell like it by the end of lunch, I walked out close to 2.5 hours later not smelling a single bit like Korean BBQ. WOW. 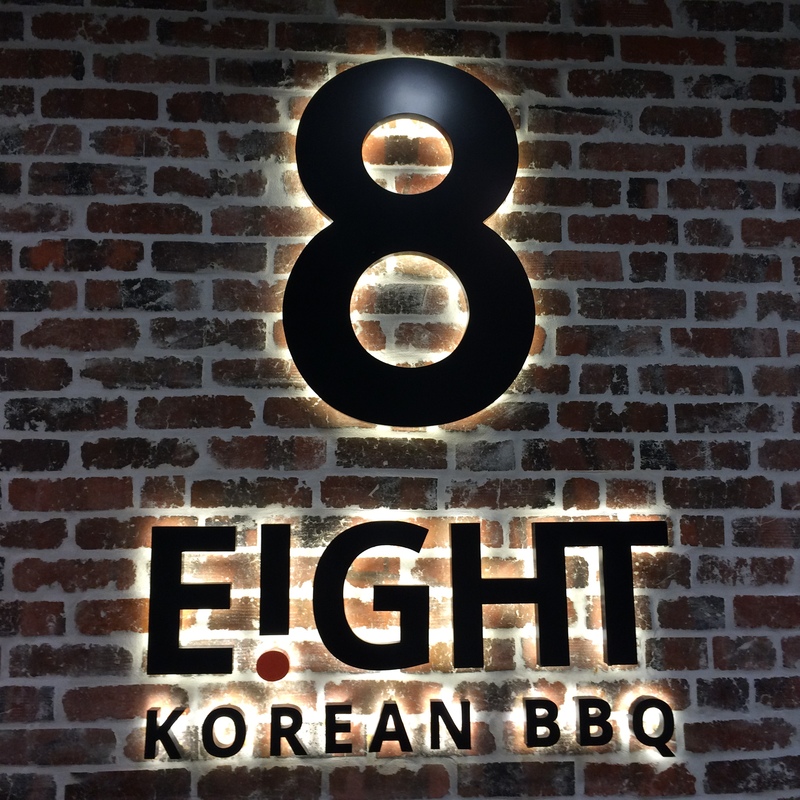 This would be my to-go place for Korean BBQ from now on, and I can’t believe I’ve only tried them now! Their al fresco area seems like a darn good place to be for dinner with it overlooking the happening street of Clarke Quay and that evening breeze. Ah, I think I’ve got my next gathering venue set!